And, it is also one of those ordinary times of day that has extraordinary potential for wonderment. 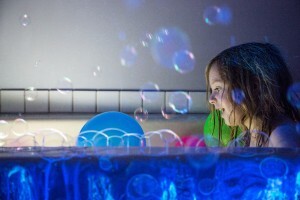 While AC was napping, I pulled out a few items (bubble machine, bubbles, towels, various lighting options – including a black light, more towels, balloons) and began to set up the room for her evening bath. Our bathroom is your basic American family bathroom. It has a tub, a toilet, some tile and a bucket of toys. That night, however, it transformed into a island of imagination. Children naturally approach life with a sense of humor and awe. We are born with curiosity woven into the fabric of our being – this is how we begin to make sense of the world. Too often, wonderment is seen as secondary and tangential to learning, when in fact, it is primary and at the heart of what propels us to explore and discover. And, every moment has the potential for robust wonderment, if we slow down enough and invite it in. 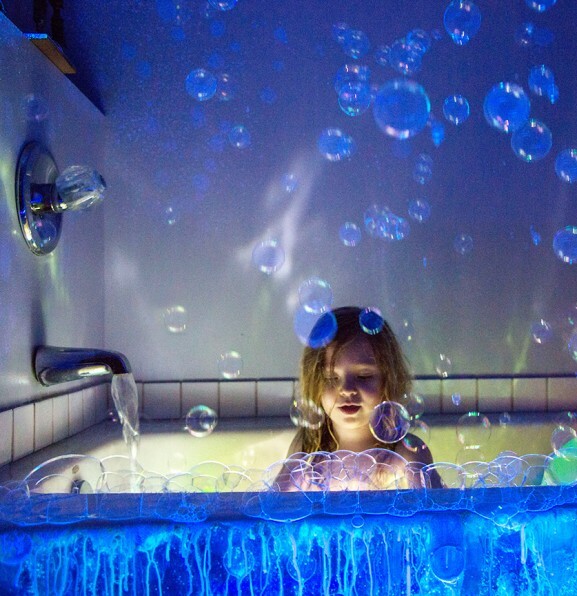 As bubbles began to flow into the bath and all around her (and over the side of the tub…), my daughter was mesmerized. She watched her surroundings become iridescent as balls of rainbows wafted around her. More and more bubbles filled the air. With millions of bubbles landing all around her and on her body, she began to talk about what it might be like to be inside of one of them. She has a strong desire to fly, and perhaps she thought this would be a way for her to finally get into the air, once and for all. She bounded out of the bath. AC examined the bubble blowing machine to see where she could climb in. She got back into the tub and we talked more about how she might be able to inhabit a bubble. Bath time ended with a lingering question and the ordinary space took on a new identity – it became a place of wonderment where time can expand and new worlds can be imagined. Now, when AC asks to take a bubble bath, I know this is what she means. 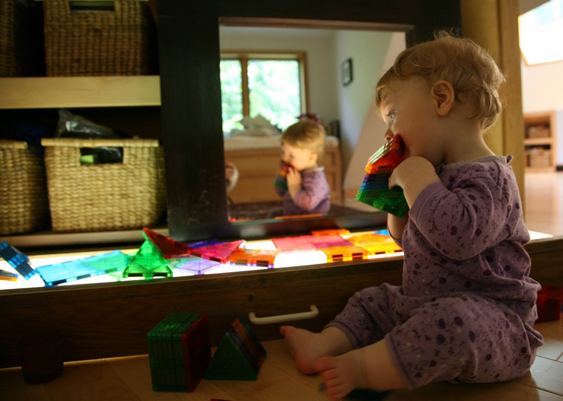 When AC was around 10 months old, she became fascinated with opening things up, taking lids off containers, removing paper – the act of uncovering seemed imperative. She had to do it. 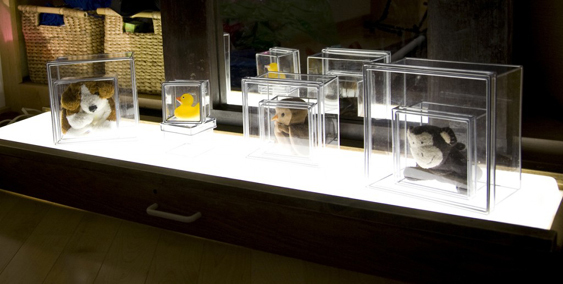 One night I went around the house and gathered all of her top favorite animals (duck, monkey, dog, and owl) and brought them up to my studio. I explained to them they would only be in captivity for a short period of time, as I put each of them inside of one or two transparent boxes, testing the lids to make sure they would come off easily enough. They would. I smiled, wondering what AC would think and feel when she saw her friends in their clear houses. And I pondered what she might do. Would she leave them there and bring things to them? Would she open up the boxes? Would she totally ignore them and find a piece of fuzz to play with on the carpet? Knowing she was in an ‘opening-things’ phase, I had a sense she would be inclined to find a way to release her friends from their boxes. 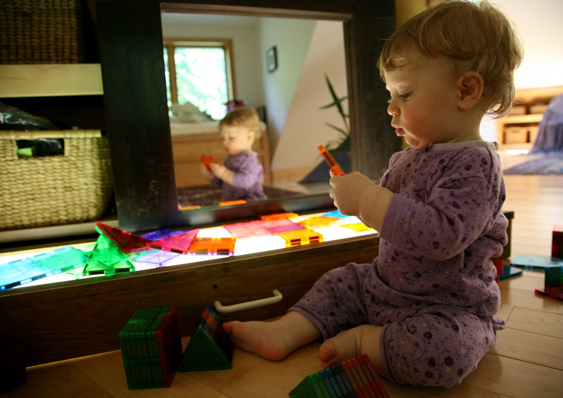 Children have the capacity for in-depth engagement at any age. 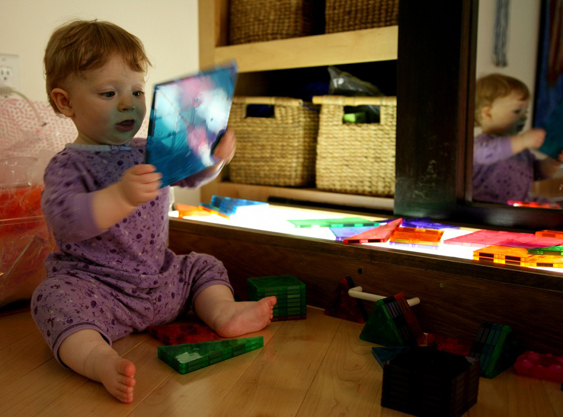 AC was 8 months old when we were playing up in my studio and she wandered over to the light table where there were color magnet tiles strewn about. I hadn’t arranged them. I hadn’t predicted what she might do. I hadn’t given the material any thought other than to look at the package to make sure I wouldn’t poison my child by giving it to her. It looked like these tiles would play well with light and so I got them for AC to use at the light table. This morning, AC felt compelled to go over to that area. She began by picking up one tile and studying it. It appeared the tile was talking to her, and she was listening intently. I’m not sure what their conversation was about, but AC was captivated. After they had their chat, she put it down and reached for the next stack of tiles near by her. She didn’t want the entire stack. She wanted another single tile, another conversation. Having troubles getting the tiles apart, she lifted the stack to her mouth – a strategy that worked well for her in getting one tile apart from the rest. Again she studied the tile, learning many things from her discussion with it, I’m sure. After numerous times of selecting a tile, observing it, hearing what it had to say, and putting it down, she then scootched herself over to get to a larger tile that was calling to her. 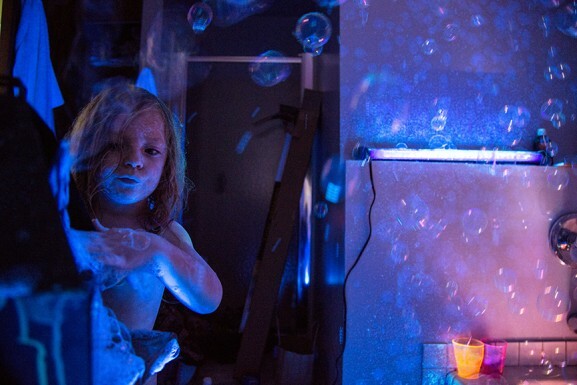 With this larger blue tile, AC started the way she had with the other tiles, but then she began to wiggle the tile, making the tile giggle with swirling light. She brought the dimension of movement into her dialogue with the tiles, and this delighted her greatly. The tiles she lifted up would dance with light, colors twirling about. 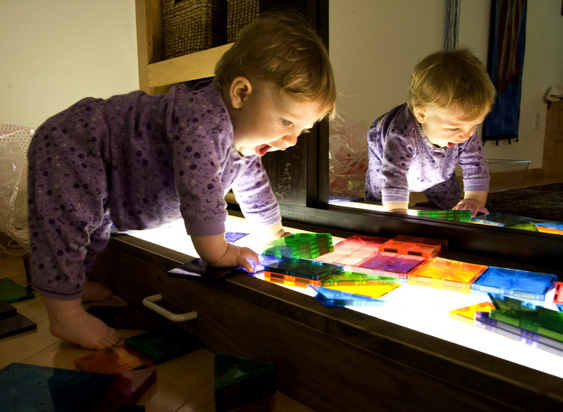 Then, the light table beckoned. The tiles of light sang to AC and she sang back. She climbed on to the table and more stories were shared between an 8 month old and her new found friends. She stayed for over half an hour before she felt it was time for a snack. We left, both of us having been touched by wonderment.